The penalties for driving a vehicle whilst under the effects of alcohol are very severe in Spain and no different to any other country, although the legal limits can differ slightly from country to country. In Spain, the standard penalty for driving with excess alcohol in your system includes a statutory minimum period of 12 months driving ban and a fine or a prison sentence. A person who is found driving a motor vehicle under the influence of toxic drugs or alcoholic beverages will be sentenced to imprisonment from three to eight months or a fine and, in all cases, a driving licence ban from one to four years. A person who refuses to agree to legally established tests for the purpose of verifying the facts of article 379 will be charged with an offence of grave disobedience. A person who driving a motor vehicle with blatant carelessness causes a serious danger to the lives of people will be sentenced from 6 months to 2 years, and a driving licence ban from one to six years. In Spain the current (Dec 2009) legal limit of alcohol is 0.5g/l blood and 0.25mg/l breath for normal drivers. For professional drivers the limit is reduced to 0.5g and 0.15g respectively. Drink driving is a major problem in Spain and the country's record of road safety and mortal accidents is one of the worst in Europe. 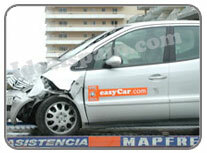 According to government figures, alcohol causes between 30% and 50% deaths in Spanish road accidents. There's probably little wonder considering the number of bars at the roadside and the Spanish laid back attitude. At Christmas time the DGT (Dirección General de Tráfico) announce tough new measures to combat drink-driving. If you are involved in a roadside breath test, you will want to behave appropriately and appear to be as sober as possible. Let the police do their job and show them respect. Your responses will be mentioned in any court appearance. Unfortunately, as a foreigner you will need the assistance of a Spanish lawyer. When choosing a lawyer, make sure that the lawyer is registered and ask for references. Unfortunately in Spain, especially on the Costa del Sol and Costa Blanca NOT ALL LAWYERS can be trusted. Some don't care about their clients and are merely looking for a quick fee (usually a very high one). [from our own experiences].